Recently an article was published titled “Letter to the Editor: Watch what you say” in which Michael P. O’Donnell visited Rice University and read an unbiased article titled “Hopes and Fears: Campus reacts to Trump.” This article asked for supporters from both sides for their opinions on the results of the election, and student Hugh Grier expressed his belief that Hillary Clinton “is a lying, cheating, bought-out criminal,” and that electing her “would undermine everything this country stands for,” a statement that while very colorful still is a reasonable response given the condition. This article sought out students with differing opinions in order to contrast the varying personal reactions among the student body in regards to the outcome of the election. In this specific instance, Mr. O’Donnell unnecessarily publicly targeted Mr. Grier in the Thresher and painted him as an ignorant, disrespectful and unemployable student whose future was called into question based on his personal political opinions. Mr. O’Donnell defamed and questioned the integrity of Mr. Grier’s morals in three parts: firstly contesting Hugh’s claims that Hillary is a worthy candidate (“Where is your evidence?”), secondly refuting his claims with a shoddy appeal to pathos (“Would you say this to your mother?”) and finally debasing and assuming that because of his views his productivity and worth as a member of society are questionable at best (“Is this someone who can be trusted?”). Mr. O’Donnell has the right to disagree with and question Mr. Grier’s opinion. However, to claim he made “inflammatory statements in public with no evidence” is unreasonable and unfair to Mr. Grier. Keep in mind the context of the original article was to gather opinions to gauge the political climate at Rice after the election. The original article asked for opinions, not 10-page peer-reviewed documents. Mr. Grier unsurprisingly didn’t provide detailed evidence in his brief quotation, but evidence still exists in support of some his claims. Even though it doesn’t concretely paint Hillary Clinton as a “bought-out criminal”, FBI Director James Comey has said that "there is evidence that they were extremely careless in their handling of very sensitive, highly classified information” which is in stark contrast with Mr. O’Donnell’s claims that “she may be the most vetted politician in our history.” Whether Hillary Clinton is as bad as Mr. Grier claims is definitely debatable, but to claim that no evidence exists to support his viewpoint is shortsighted and heavily biased. Besides this main point of contention, I take heavy offense to Mr. O’Donnell’s attempts to discredit Mr. Grier’s merit based purely on his three-sentence remark. Mr. O’Donnell implied that Mr. Grier would not be a “productive member of society” and that he couldn’t “be trusted to represent [organizations] in a professional way.” Ironically here Mr. O’Donnell should watch what he says, as he is openly slandering and potentially harming Mr. Grier’s future career opportunities which is inexcusable to be publicly printed in our student newspaper. I find it deeply problematic that the Thresher allowed this kind of journalism constituting nothing more than mudslinging. 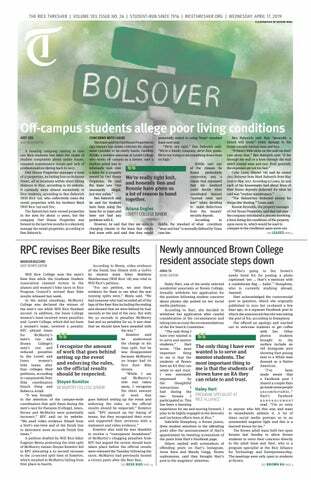 It’s even more saddening that the Editor in Chief of the American Journal of Health Promotion, Michael P. O’Donnell, had nothing better to do during his visit to Rice University but publicly ridicule and berate a student for having different beliefs and opinions than him. I expected more from a man of such distinguishment and merit.